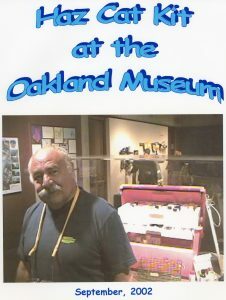 In 1982, a small group of hazardous materials professionals and chemists, headed up by Robert Turkington, the founder of HazTech Systems™, Inc. working with California’s Responder Risk Assessment Unit of the Division of Occupational Safety and Health, came together to address a vital issue facing the nation’s hazardous materials responders: substance identification in the field. This effort was a direct result of a spill on California’s Oakland Bay Bridge in 1980. 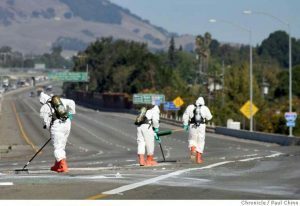 The spill, which was later identified as Magnesium Silica Oxalate by laboratory analysis, resulted in a twelve hour closure of the bridge and underscored the need for an identification tool that could be used in the field by personnel with a limited chemistry background. To answer this need, a rough version of the HazCat® system and training was presented to UC Davis followed shortly by UC Berkeley, UC Riverside, UC Irvine, UCLA and UC Santa Barbara, all attempting to establish an Environmental Health Program. After several years of field-testing and refinement, the HazCat® Chemical Identification System has been available to HazMat responders, nationwide since early 1986. Today, the HazCat® System is used by environmental professionals and emergency responders throughout North America, including the Environmental Protection Agency, the Centers for Disease Control, the Department of Defense, the Department of Energy, the Army Corps of Engineers, the U.S. Coast Guard’s Hazardous Materials Strike Team and most major North American Fire Departments. HazCat® is also used in Asia, Europe, Greece and several former Soviet Union nations. For nearly a quarter of a century, HazTech Systems™, Inc. has equipped public safety personnel with the tools and certified training to identify the unknown chemicals involved with chemical spills and hazardous material releases. The terrorist events of September 11, 2001 changed the landscape in which the emergency response community operates. The HazTech Science Team has responded to this event with a Biological substance identification methodology that is in use today. Terrorism and the threat of terrorism has become a part of everyday life. Almost overnight the term “Weapons of Mass Destruction” became part of the national lexicon. With regard to the anthrax releases in 2002, although causalities were low, the public concern these releases created, required health officials and safety personnel to respond to tens of thousands of unfounded incidents. HazTech Systems™ Inc. is meeting the challenge of the post 9/11 environment by providing comprehensive, easy to use, approaches to identifying the unknown substances involved with chemical, biological and radiological events as well as industrial chemical and clandestine lab releases. HazCat can positively identify unknowns in as many steps as other field ID systems take to categorize them. The difference between identifying and merely categorizing an unknown substance can be important. HazCat differentiates between incompatible subsets of oxidizers. along with explosive oxidizers such as benzoyl peroxide, ammonium nitrate and ammonium perchlorate are nabbed by HazCat before they are bulked dangerously. Other field ID Kits cannot identify these dangerous substances. HazCat is versatile enough to identify multiple-component unknowns as well as non-hazardous materials in order to expedite clean-up operations. Remember: According to federal law, a non-hazardous substance must be treated as hazardous until it is identified. https://hazcat.com/wp-content/uploads/2017/04/cat-1.gif 0 0 admin https://hazcat.com/wp-content/uploads/2017/04/cat-1.gif admin2017-05-12 15:53:142017-05-12 15:53:14What's That Smell? What HazCat Materials Are Perishable? https://hazcat.com/wp-content/uploads/2017/04/cat-1.gif 0 0 admin https://hazcat.com/wp-content/uploads/2017/04/cat-1.gif admin2017-05-12 15:37:532017-05-25 22:01:12What HazCat Materials Are Perishable?